On May 12th, 2008 the infamous 8.0 magnitude earthquake centered in Sichuan’s Wenchuan County dealt a brutal blow to Sichuan’s tourism industry. As the region recovers, expect many of the gems of Sichuan to be revealed to an ever-larger audience. National Highway 213, which connects Chengdu with many pillars of northern Sichuan tourism, was closed for much of the late spring and summer during the heart of Sichuan’s peak travel season. Nearly two years later, highway 213 is plagued with traffic jams as countless trucks ply the road carrying away earthquake debris and delivering new construction materials. Meanwhile, a new brand of “earthquake tourists” begin to stream into the region, further straining the regions’ precious resources. While tourism strongholds along 213 including the Wolong Panda Reserve, Songpan and Jiuzhaigou were negatively affected, a new route through Mianyang County which leads into eastern section of the Min Mountains will allow some formerly largely unknown destinations to receive newfound attention. Heading northeast out of Chengdu it’s a 3 hour drive along comfortable highways through Sichuan’s eastern plain until you can stretch your legs at the Li Bai memorial at Jiangyou. 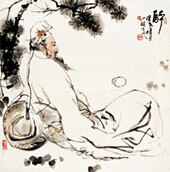 Li Bai is traditionally regarded as one of China’s two most famous poets along with Tang Dynasty counterpart Du Fu. In stark contrast to Du Fu’s writings of hardship and struggle for the peasant class though, Li Bai is known for his wild imagination and positive philosophies towards life. Once past Jiangyou, a familiar northern Sichuan scene re-emerges: steep roadsides lined with temperate forests give way to foggy and mysterious ridgelines above. Slithery mountain roads knife through the mountains alongside rushing waterways draining the surrounding peaks. It’s two more hours of increasingly dramatic scenery to the small city of Pingwu, whose central urban area is crammed onto a thin slice of land surrounded by a sharp turn in the Fujiang River. Pingwu is home to a large Islamic Hui minority population, littering the town with lamb and beef specialty restaurants. The city’s main attraction is Bao’en Temple, a Buddhist shrine which dates back more than 500 years. The temple incredibly suffered minimal damage from the 2008 earthquake. Climbing up the stairs in the city park adjacent to the main road quickly offers great views of the city. Likely the most stunning aspect is the mini-city of pre-fabricated homes with plain blue roofs housing countless earthquake refugees along the riverside. Continuing northward from Pingwu the mountains seemingly shoot vertically upward directly along the roadside. The increasingly heightening scenery races through a narrow river gorge until an unmistakable fork in the road brings travelers to the entrance of the Tibetan Baima region, and the Wanglang Valley. The auspicious scene at the entrance just meters away from Highway 213 is oddly significant of the Baima people’s situation. A noticeably quiet, dusty row of stores selling colorful Baima clothing and jewelry is dwarfed by a modern gateway. The imposing stone gate is adorned with 4 large white feathers and a fantastic facial depiction with exaggerated features reminiscent of Mayan iconography or the Bayon at Angkor Wat. Peeking through the unusual, gaudy new entranceway shows coaxes you around a sneaky mountain pass, but clearly few make the trip. Improved road conditions, the recent introduction of power lines, and tourism investment at the Wanglang Nature Reserve 60 kilometers beyond the gate encouraged local Baima villages to construct basic guesthouses and other modest facilities with a local Baima touch. However, the earthquake, and likely the region’s remote location along a far less known travel route, have not delivered the anticipated tourism return. A handful of miniature Baima settlements offer vibrantly painted wooden inns, local cuisine, and small Baima dress and song performances along the road between the main gate and the entrance to the Wanglang reserve. 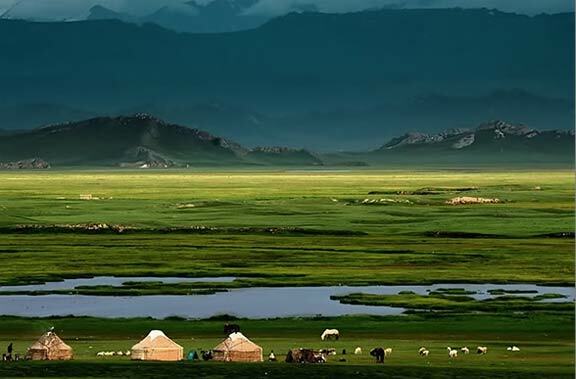 The story of just how this miniscule Tibetan cultural subdivision, with an estimated population of 3,000, arrived at the far end of the Tibetan Plateau remains unclear. Both China’s minorities classification system and anthropologists believe they are descended from Tibetans due to language and subsistence similarities, but their unique architectural and decorative styles suggestotherwise. The Baima practice an animist religion, unlike the majority of Tibetans who are Buddhist. As is evident at the gate, the Baima are most well known locally for a tradition of colorful clothing styles. Older women in particular tend to uphold the custom colorful dress, which often is complemented by a soft cap with a feather in it. While tourists from around the world flock to Northern Sichuan’s legendary parks, Jiuzhaigou & Huanglong, Wanglang, which shares a border with both parks, remains virtually unknown by domestic and foreign tourists alike. The Wanglang Nature Reserve was founded by the Sichuan Forestry Bureau in 1963, and is likely as quiet and peaceful today as it was upon its creation 46 years ago. While the reserve doesn’t boast the array of massive waterfalls and crystal clear glacial lakes of the neighboring national parks, it offers a keen sense of serenity and impressive environmentally protective measures rarely seen elsewhere in China, such as anti-poaching patrols. It is estimated that 30 of the less than 1,000 wild Giant Pandas in existence reside within the reserve, which ranges between 2,400 and 4,980 meters in elevation. While catching a glimpse of a Giant Panda is a rare and special experience, visitors who take their time exploring Wanglang’s trails still have a good opportunity to observe other unusual animal species including golden snub-nose monkeys, blue sheep, takin, musk deer, and a wide variety of bird species. Birdwatching is particularly highly regarded during the spring and fall migrations. Besides Wanglang, Pingwu County includes two other nature reserves, and the entire county is estimated to be home to 15% of the world’s giant panda population. Wanglang currently represents one of China’s finest eco-tourism destinations. The reserve includes a comfortable lodge, hiking trails, picnic areas, and naturalists available to guide hikes. The reserve has worked closely with the World Wildlife Fund (WWF) to promote environmental sustainability and education through activities, lectures and other resources at the lodge. The WWF also helped to build two excellent nature trails at 2 different sites in the reserve. Visitors who walk these trails quickly see that the reserve is rarely visited. From the high northern reaches of the reserve it’s actually possible to make a tough 2 day trek into the backsides of either Huanglong or Jiuzhaigou. Clearly tourism potential exists on the other side of the Minshan range. As domestic tourism continues to boom across China, it’s only a matter of time until this section of northern Sichuan has its day. In the wake of the Wenchuan earthquake, lesser known destinations are certainly waiting for their due attention and admiration. What do you think of travel about the Western Sichuan region? Sichuan western mountain areas are wonderful place to visit – unless you are stopped and harassed by local authorities demanding to see some special visitor permits, visas unknown elsewhere in China. But yes will definetly go again! Looks like such a beautiful region. Hard to believe I’ve been here so long and haven’t made it to so many destinations in Western Sichuan. That must be changed! I’d love to see a post outlining an itinerary or two that you recommend including schedule, info on booking, accommodations, etc to destinations nearby Chengdu. Solid post. I’ll keep Wanglang in mind for a weekend excursion this spring. 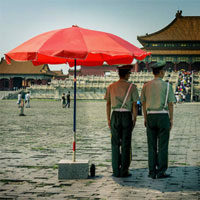 Check out overlandchina.com. They are very knowledgeable when it comes to the information you seek. Ive used them before when in Sichuan and would say they really know their stuff. Its hard to believe that any small cultural subdivision can continue to exist in Tibet. Have the extreme cold temperatures this winter negatively impacted their ability to survive? Thanks for the support Mike! It is pretty darn cold every winter in Sichuan, but the Baima grow a lot of potatoes and cabbage. Those crops survive in pretty much any conditions. In fact I read recently that global warming has allowed communities on the southern coasts of Greenland to actual start having modest potato and cabbage harvests in summer. This is such a great resource that you are providing. I enjoy seeing websites that understand the value of providing a great resource for free. 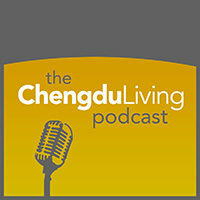 Thanks Chengdu Living!